Ha-Neul (Jang Na-Ra) is a gifted violonist who stays at home mostly. Ba-Da (Hyun Jyu-Ni) was abandoned by her parents. 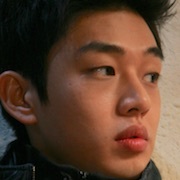 Jin-Kyu (Yoo Ah-In) lost his parents at an early age and now delivers pizza. Through music, friendship, and love these three friends will learn lessons on life. "Haneul" (name of character played by Jang Na-Ra) means literally "sky" in Korean, and "Bada" (name of character played by Juan) means literally "ocean" or "sea" in Korean. One scene will take place in the desert and will be filmed on location in China on May 8th. Staff members filed a lawsuit against production company Christmas Entertainment (크리스마스엔터테인먼트) for non-payment of wages. Co-producer Joo Oh-Sung (also the real life father of Jang Na-Ra) told Korean media that during production of "Sky & Ocean" money was tight, but they are now actively negotiating to pay the unpaid staff members. According to an October 21st posting made by Joo Oh-Sung on his daughter's website, (narajjang.com), an anonymous female fan donated 100 million Won ($86,000 USD) to the cash strapped movie production company to promote "Sky & Ocean" and fullfill other expenses. "Sky & Ocean" received nominations for "Best Film" and "Best Actress" at the upcoming 2009 Daejong Film Awards. These choices were somewhat controversial because the nominations came prior to the movie's release & the selection of Jang Na-Ra for "Best Actress" over actress Ha Ji-Won (for her performances in "Haeundae" & "Closer to Heaven"). In response to the criticism the Daejong Film Awards released a press statement stating that films can be nominated prior to their release date if submitted by a certain date and because Ha Ji-Won appeared in two popular movies her votes were most likely split among those two separate films. "Sky & Ocean" opened #9 at the South Korean box office during its opening Oct. 30th - Nov. 1st weekend. The movie sold 9,952 tickets on 224 screens and accounted for 0.9% of all tickets sold that weekend. On November 9th, through (narajjang.com) it was announced that "Sky & Ocean" would be pulled from all theaters effective immediately. In the announcement two primary reasons were given: 1.) difficulties in gaining screening slots for entire days (the film was shown either at night only and during the afternoon only - depending on the cinema's split screen schedule) and 2.) harsh media criticisms on the film relating to its poor box office showing and the surprising "Best Film" and "Best Actress" nominations at the 2009 Daejong Film Awards. Actor Yu Ah-In came out publicly on November 9th via his Cyworld homepage to speak out against the movie's producer Joo Oh-Sung (who is also the father of the movie's main actress Jang Na-Ra). In Yu Ah-In's Nov. 9th Cyworld post, he criticized Joo Oh-Sung for overstepping his duties as a producer on the movie set. Yu Ah-In stated that Joo Oh-Sung would frequently hold the bullhorn and direct when to cut scenes, as well as dominating the direction for the final concert scene in the movie. Yu Ah-In also criticized Joo Oh-Sung for his recent public statements blaming the media and the movie's inability to screen for entire days as reasons for the movie's commercial failings. Rather than blaming external sources Yu Ah-In stated the the staff should reflect on their own shortcomings. Also Yu Ah-In complained that he was not notified the movie was being pulled from the theaters. Following Yu Ah-In's public statements, Joo Oh-Sung conducted an interview with Star News in which he refuted Yu Ah-In's claims and also stated he considered taking legal actions against Yu Ah-In, but his daughter persuaded him not too. Joo Oh-Sung also criticized Yu Ah-In for not making promotional appearances on behalf of the film. Trung Nguyen Dec 17 2013 3:18 am This movie is wonderful, but for only sweet people. I mean, it's obvious for you to see it has so much "cute and sweet" in there, but when you understand why Ha-Neul (Jang Na-ra) has struggled through orphaned and why she eats pizza and plays violin everyday, you will get its idea. It's perfect for the content, the music, and the characters. For me, it's a good idea for watching it again in to get the true meaning before attacking it. Skip over the scandals above, I think it's a great present for Jang Na-ra and our audience from her father, Oh-seong Ju. Loveyoo Sep 26 2013 9:58 am This movie kind of disappointed me :/ I think the characters could have been written better... i mean come on, you've got three sterling actors in your film and an okay (notveryconvincing) storyline, at least the built up of the characters could have saved it. sak8ura Jan 31 2012 12:55 pm I watched the movie. I thought it was very touching and very meaningful. Cried a bit at the end. Would recommend. Jang Nara did a GREAT job portraying a person with a mental age of 6. GREAT MOVIE. bjharm Apr 05 2011 8:13 am It is to be noted that Jang Nara won best actress in a foreign film in China for her role in Sky and Ocean, as well the film itself getting awards at overseas film festivals, so whatever the reason why it 'bombed' in korea it had little to do with acting or story but more to do with media attacks against ii...as was the reason stated by Jang Nara as to why it was pulled out of all Korean theatres after only two week, as a protest against those attacks. RamenLover Nov 01 2009 8:09 pm Movie pretty much bombed at the box office this past weekend. 9,952 tickets sold on 224 screens. Hopefully it picks up viewers in its second week. bjharm Jul 27 2009 4:02 am Like many I would think, looking forward to its release. The preview is said by one there 'Many people laughed a lot and cried a lot. Elements indispensable for a hit-making film.' Let hope it well be so. 장나라 '하늘과 바다', 송사 휘말려..주오성 "오해일뿐", "Yahoo! Korea News," September 22, 2009. Nomination Dispute Mars Daejong Film Festival, "Korea Times," October 23, 2009.